Today I am a happy woman. While making the next recipe in the OUR COOKIE NATION series, I came to Hawaii's most requested recipe of shortbread. 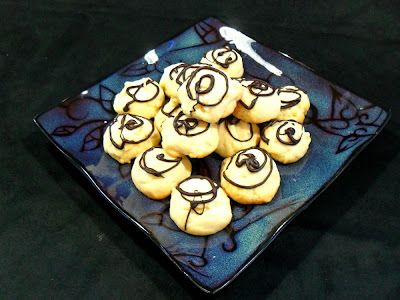 I am a huge fan of shortbread cookies, and as far as shortbread recipes are concerned, this is the first "keeper" I have found. Loved, loved, loved this cookie (my family said they wanted the cookie to be sweeter, but what do they know about shortbread? LOL). In a medium size mixing bowl whip butter until fluffy. Stir in the powdered sugar, cornstarch and flour. Beat on low for 1 minute until combined, and then on high for 3 to 4 minutes. The dough will become smoother and creamier as you mix it. Drop by spoonfuls 2" apart on ungreased baking sheets. Bake for 12-15 min. watching that the edges don't become too brown. Cool on wire racks and decorate if desired. The other day I realized we are almost 1/2 way through the 2011 year, and I am WAY WAY WAY behind in completing my series OUR COOKIE NATION. Geez! So I will be working frantically to catch up on my cookie making list. In a medium bowl cream the butter and sugar until light and fluffy. Stir in the vanilla and water. Add the flour and almonds and mix until well incorporated. Cover and chill for 3 hours. Scoop the dough into balls about the size of a walnut. Roll in your hands to shape, or make into crescent shapes. Place on ungreased baking sheets, and bake for 15 to 20 minutes. Remove from the oven and cool the cookies on wire racks. When the cookies are cool, roll each cookie in the powdered sugar. Store at room temperature in an airtight container. THESE COOKIES WERE A BIG HIT WITH EVERYONE WHO ATE THEM, AND MY FAMILY ARE IN LOVE WITH THEM TOO! 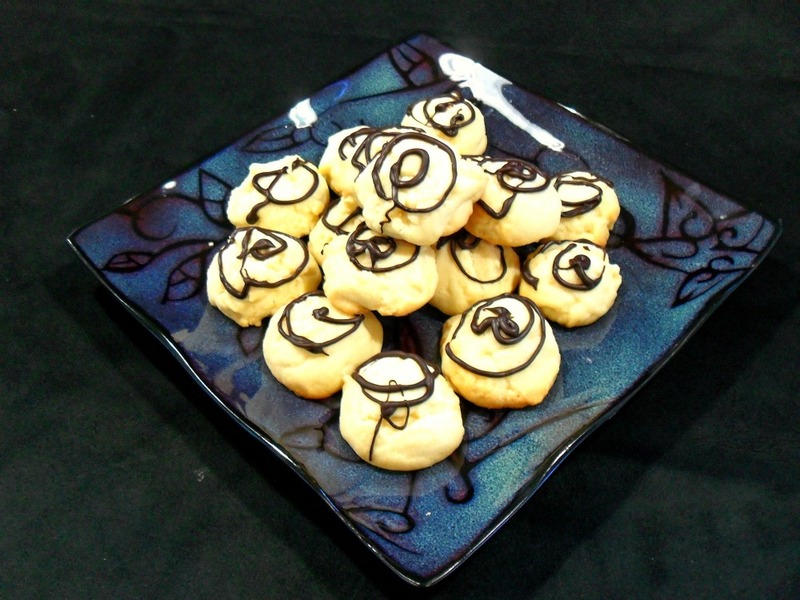 Very easy to make, these cookies are very flavorful. Note: I used 1 c. chopped pecans because my family prefers them to almonds. Also, I think these would make a great cookie for a baby shower. Tinting the powdered sugar with a powdered food coloring in pink, blue, yellow, purple, green etc. would turn these into a fun presentation! My family really loves the Boston cream pie recipe so I thought that changing it up a bit would be fun. IT WAS! Slice the angel food cake horizontally into 3 layers. Beat the pudding mix and milk in a medium size bowl for 2 minutes. Stir in 1/2 c. whipped topping. Chill for 15-20 minutes until thickened. Place 1st layer of angel food cake on your serving plate, and spread 1/3 of the pudding mix over the cake. Place the second layer on top of the 1st layer and spread 1/3 of pudding mix on top. Place the 3rd layer of cake on top and top with remaining pudding mix. Prepare glaze by melting the the chopped square of baking chocolate and the remaining 1/2 c. whipped topping in a bowl in the microwave. Use 20 second increments to melt the chocolate, stirring in between each time until chocolate is completely melted and whipped topping is combined. Pour over the top layer of cake. Chill for 1-2 hours, then serve and enjoy! After the cake has been refrigerated overnight the cake is and filling are more set and less sloppy. We love the cake the second day (if any survives the 1st one). I'm admitting we didn't wait the additional chilling time after the cake was assembled, it was a bit messier but soooo yummy! A note: I think the next time I make this recipe in the chocolate cake version I am going to try using chocolate fudge pudding mix...and maybe fresh raspberries in the layers. I think a white chocolate glaze would be divine with this combo! Have you ever read friedalovesbread.blogspot.com? 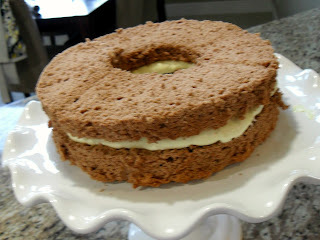 I adore her blog, she has wonderful recipe's with some great tutorials, and a fun sense of humor! Move your oven rack to the lowest level and then preheat oven to 350 degrees. In an extra large mixing bowl allow the eggs whites to stand at room temp. for 30 minutes. Sift together the powdered sugar, flour and cocoa. Repeat the sifting 3 times and then set aside. Add the cream of tartar and vanilla to the egg whites, and then beat with an electric mixer on medium speed until soft peaks form. Frieda explains that the peaks will curl when the beaters are lifted from the mixture. Gradually add the white sugar, 2 Tablespoons at a time, beating until stiff peaks form (peaks will stand straight up when you pull the beaters up out of the mixture). I used my Kitchen Aide stand mixer for all of this, I think it would have taken longer to do this with a hand mixer. Sift about 1/4 of the dry ingredient mix over the beaten egg whites and gently fold in. Repeat with the remaining dry ingredients adding 1 quarter at a time. Pour the batter into an ungreased 10" tube pan. Gently cut through the batter with a knife to release any air bubbles. Bake for 40-45 minutes or until the top springs back when lightly touched. Remove the cake from the oven and immediately invert the cake. If the cake has risen about the edge of the pan, place it over a funner or bottle. Cool thoroughly. Loosen the sides of the cake from the pan, and remove to a serving plate. 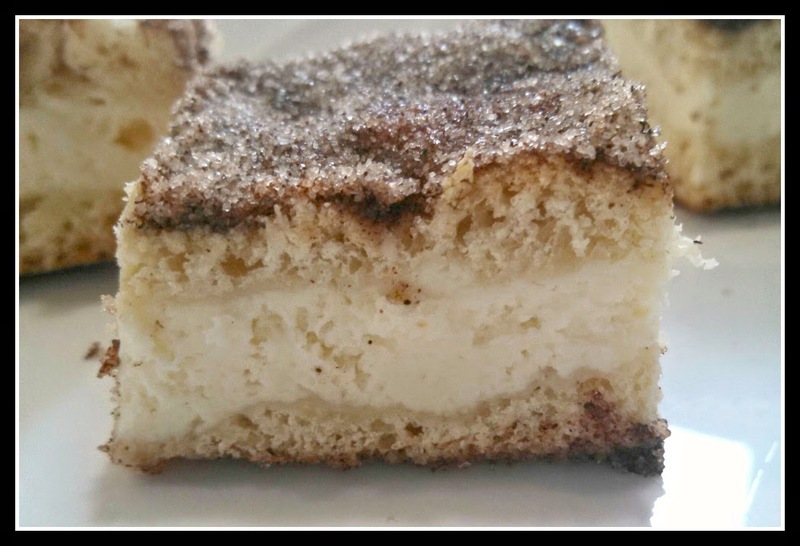 Frieda's Chocolate Angel Food Cake? really be following her, she will inspire you!